Can you make money from social media? If you understand the process. In this post we are going to show you how you can follow the PRISM process to build revenue from social media marketing. To make money from social media you need to build influence. Influence is built through growing an active and engaged community. Once you have an active and engaged community you can drive a part of that audience to your website and this is where sales happen. Sales typically doesn’t happen on the social media channel so you need to understand the process of building a social media sales funnel to drive those sales. This is where PRISM can help. It’s a process to build influence and sales. You start off with social media by building an audience. Does the size of the audience actually matter? Yes it certainly does if you are building a relevant audience that is engaging with your content. If you have 1,000 followers on Twitter that are directly relevant to the products/services you are selling and these are engaged with your content then it makes total sense that adding another 1,000 similar followers will add more benefit. Of course it’s not all about numbers. There are many companies that have hundreds of thousands of followers that ignore what they say. So you need to build relationships with your audience. Build relationships with your customers, potential customers, partners and influencers. People buy from people they know, like and trust! Sales happen on your website so you need to have a strategy in place to drive traffic from social media to your website. Did you know that over 70% of your website visitors don’t ever come back to your website? To continue to market to visitors to your website you need to encourage them to take action on your website. Not everyone will be ready to immediately buy your products or services so encouraging them to become an email subscriber is extremely valuable. Email is a great way to build the relationship with your website visitors and sell products over time. The majority of visitors still won’t buy your products or subscribe via email so it’s useful to retarget your website visitors on channels such as Facebook. Once you build your community over email you then need to work out your monetization process. This is the monetization component of your social media sales funnel. You communicate with your audience over email and continue to market your products/services through the provision of valuable content. Over time (days/weeks) you give the prospect an opportunity to take the next step. This is at a time when you have convinced your prospect of the value you can provide and their needs that you can fulfill. The next step could be an offer for a product or service, an invitation to a webinar where you sell your product or service or something else that works for your business. You can build a profitable presence on social media if you know the tactics and process do to do. Join us on our webinar where we will share specific tactics you can implement that will deliver the results you want. Ian Cleary is the founder of Razorsocial and a digital strategist with a strong passion for technology. He writes for Forbes and Entrepreneur.com and has been featured in major industry publications including VentureBeat, New York Times, Fox News, Huffington Post, and many more. Ian is also a conference speaker, ranking consistently among the top 50 content marketing and social media influencers in the world. He recently co-founded OutreachPlus which is email outreach software. 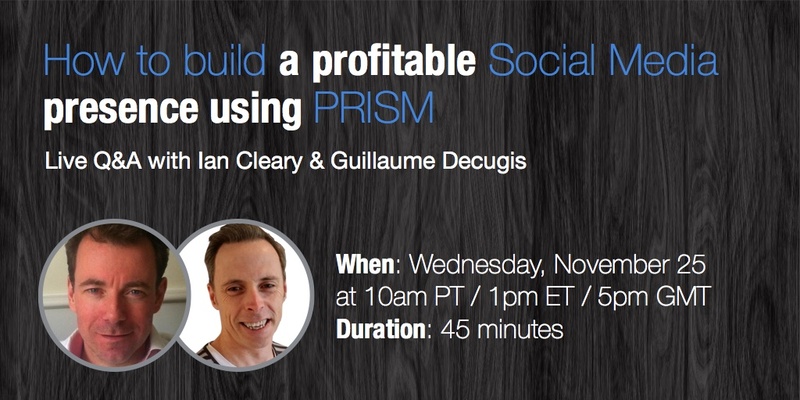 3 Comments on "How to build a profitable social media presence using PRISM"
Hi Ian Cleary, you have done a great job, creating a single word PRISM for all the things. And i agree to you in each and every thing you have written, i was familiar about these tactics but not that deep. I run a blog named Tricky Enough which is doing good on the internet but after reading you post i think it work more better. Thanks a lot for the post.